One day about 10 years ago, when I was still in New York City, I got a call from an extremely happy student who had just gotten her SAT score. It went up 260 points on the old 1600 point scale. She scored in the 1300‘s, and never thought she would do so well. I’d only worked with her for 3 weeks, getting her ready for her last chance to take the SAT before college applications were due. When she called, she was on cloud nine. Now she could apply with confidence to schools that she never would have had a chance get accepted to before she got that score. Then her mother got on the phone and wanted to know how I did it. In truth, I didn’t know. I’d only been tutoring for a couple of years and some of that was part time. Back then, I was like most reasonably competent SAT tutors. I had a strong grasp of the material on the test and the problem solving skills necessary to do well. I was probably better than most at conveying them simply and clearly. I enjoyed working with high school students. I still do. In a certain way, I had gotten lucky. She already knew most of the math they test for on the SAT. She could read, of course. There was no Writing section at the time. She just didn’t know how to approach the test. When I showed her how and she did great on a practice test, her confidence soared. Her self image as a student and a test taker grew, as did her motivation to practice even harder. She had experienced an inner shift. That’s how she got such a huge increase in her score. Unfortunately, I wasn’t aware back then that this was the key. So while most of my students improved, some extraordinarily, I wasn’t able to consistently help my students make such great gains. One day not too long ago, I was in a meeting with the college admissions counselors at one of the private high schools in Los Angeles, where I currently live. They’d referred a lot of students to me over the years, so I wanted to ask them whether there was any particular note that came up when parents spoke to them about the my work. I got a very interesting response. One thing that kept coming up, they said, was that parents of kids who had been evaluated with a learning disability repeatedly told them that not only did their kids do well on the SAT, but they also, for the first time in their lives, felt confident about taking these kinds of tests and confident about their school work in general. For the first time, they felt like everything was going to be OK. I hadn’t expected that note. I’ve worked with a lot of kids over the years and the majority are not learning disabled. But what the counselors said was true, of course, so I became curious. What made this so? With a few more years of experience I could finally answer the question. I’m patient. I have a good understanding of the relationship between learning, emotionality, and the beliefs and expectations that a student has about herself and how she’ll perform on the tests. I know the material very well and I’ve worked with a lot of students, so I can quickly size up a student’s strengths and weaknesses, and infer the strategies she’s using. I relate to their conditions as differences, not disabilities. And I can usually show her a way to maximize her strengths and minimize her weaknesses. It turns out that it’s the same basic approach I take with all my students. That’s why these days many parents know how I get results. They don’t have to ask any more. 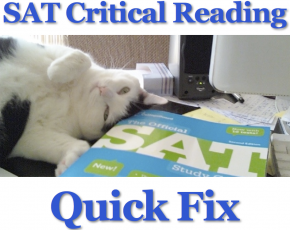 That’s why they say things like, “Your skilled tutoring helped (my daughter) keep the right frame of mind, and went a long way to prepare her mentally and emotionally, not just academically,” for the SAT. I’d become aware of the key, and I could turn it consistently to help my students get great results. We humans are great learners. When we’re babies and young children, we’re learning machines. Then at a certain point, things get in the way of learning. Not everything, but some things. We all have an easier time learning some things and a harder time learning other things. Which is which is different for different people. But why? Let’s take me as an example. Why did I have an easy time learning to be a software developer and a hard time learning to be an actor? Why could I become a skilled fundraiser going door to door raising money for environmental causes, while it’s still sometimes hard for me to make a business or networking call to someone I don’t know? Why could I learn math and history pretty easily, but I could never learn to make a layup in basketball? Well, we all have different talents, of course. I could never play basketball like Kobe Bryant, and not all of my students can get a perfect score of 2400 on their SAT. But it goes deeper than that. It was easier for me to learn some of those things than others because I believed I could learn them. I was relatively certain that I would get good at them. For the things I had a hard time with, it was the opposite. I didn’t start out believing I could do them. In fact, I believed that I was bad at them, and I was relatively certain I would stay that way. When I made mistakes and did things wrong, which always happens when we learn new things, it reinforced my negative beliefs. Sometimes I felt foolish, or even embarrassed. I’ll be honest with you. Sometimes I even felt like I wasn’t good enough as a person. It was a deep feeling of shame. We all go through it sometimes. I just happen to be more in touch with it than most people. I believe that’s because I was born with a challenging, and rare, medical condition. Since most people would never know or probably even guess from looking at me that I even have it, for a lot of my life I felt alone with it. I couldn’t escape the introspection. I guess that’s another way I got lucky. What I’ve come to realize is my emotional experience, which I thought was unique to me because of my circumstances, is actually pretty common. We all at times feel afraid, insecure, and like we’re not good enough. When we do, it’s hard to keep taking action, to keep practicing, and even to do the simple task of listening and paying attention to what’s being taught. No wonder it’s hard to learn and improve. So that’s why I’m in touch with these barriers to learning and performing at one’s best, and why I know how to help you get past them so you can reach your goals. It’s why even though I scored in the 98th percentile on the SAT and went to Brown University, I can relate just as well to the student who would be thrilled to death to get a 1750 as I can to one who got a 2100 and is trying for a perfect score. I can’t claim to know what you’re going through. I don’t. I’m not in your shoes. I can relate to your experience, and in this area of life I can help you change it. It’s all about having an inner shift, the right frame of mind, a positive attitude. Then the material covered on the test, the problem solving skills, and even the level of focus you need to do really well become pretty easy to learn. That’s the secret to SAT success. I want to help you have it.